It was 'Derby Day' on Saturday when Ayr 1s, 2s and U18s travelled to Fullarton Park to take on neighbours Marr Rugby. The 18s got the action underway at midday. On the main pitch Ayr A were humbled by a rampant Marr A side who cruised to a 24-0 victory in front of a home crowd. On the back pitches Ayr 18s found redemption when their Bs battled back from a 22-7 half time deficit to seal a 22-27 victory with seconds to spare. At 14.00 it was the turn of the 2nd XV. Ayr centre Zac Howard broke clear to touch down within the opening minute to set the tone of the match- from then on, it became light work for the Millbrae men. Further tries from Harry Warr, Finn Bark, Craig Miller, Wolf Van Dijk, Logan Richardson, Grant Hutton, Harry Lynch and James Baird contributed to a 7-59 beating of Marr's newly-promoted reserves. The main event got underway at 15.30 and although just a 'friendly' the people of Ayrshire came out in their droves to show their allegiance.-A sea of purple and gold was interrupted by a bold baby pink. Ayr's intensity was on full display straight from the opening kick-off. Multiple bullish carries within the opening minutes put them inside Marr's 22 before speedster Ollie Smith darted in from out wide. The tricky touchline conversion skewed just wide of the posts. On the ten minute mark Ayr doubled the score when Scott Lyle charged down a clearance kick. He managed to reclaim the ball and use his attacking prowess to glide through the scrambling defence. Ayr's third came minutes later. Millbrae new boy David Corbenici punched through the line before feeding the supporting Ruairidh Sayce. The front rower looked for the try line before offloading to David Armstrong who breezed in under the posts. Lyle converted to make it 0-17 in just thirteen minutes. Marr were able to grab one back when their number eight bundled over from a rolling maul. As the game moved into it's second quarter Scott Lyle managed to break into the home sides 22. He found Craig Gossman outside him who pinned his ears back and dotted down in the corner. Gossman wasn't done yet however and just ten minutes later doubled his tally with another blitzing run up the touchline. Just before half time Marshall Sykes- who's ball carrying was at the heart of all that went right in the first half- was rewarded with a try of his own. 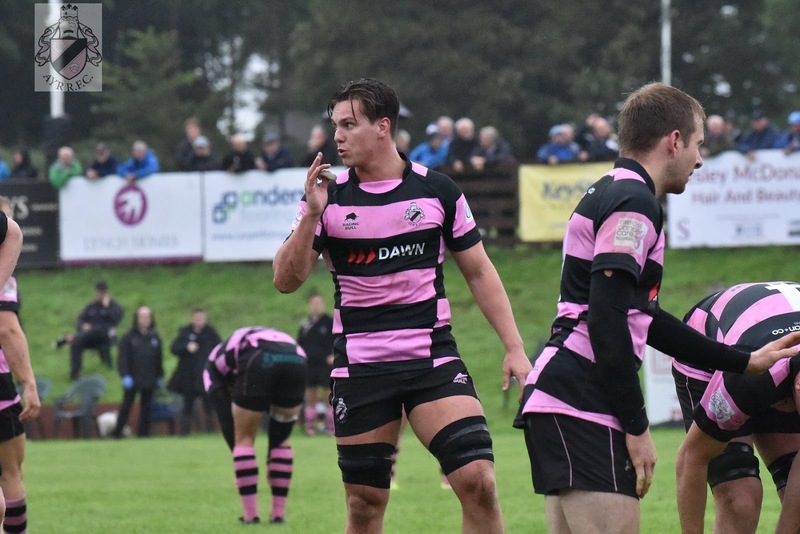 Craig Gossman danced along the touchline to get Ayr within arms length of the line before the second rower powered over. With a comfortable lead at the break you would suspect Ayr may begin to slow down, but as the second 40 began they somehow found another gear. Fluid attack from Ayr found Grant Anderson out wide who strode home within the first thirty seconds of the restart. On the 48th minute Frazier Climo, who had a try controversially chalked off in the first half, showed his illusiveness as he ghosted through three tackles and ran in from halfway. He converted his own try to make it 7-50. The sustained pressure on Marr was proving to much and on 56 minutes a weak clearance fell into the hands of a striding Grant Anderson. He fooled his opposing number with a crafty show 'n' go before feeding Paddy Dewhirst on his outside. The youngster sprinted in to add to the already emphatic lead. The next try came from another Ayr newbie. Gloucester Academy product Alfie North showed his power by carrying over the line, without regard to the three straggling tacklers trying to pull him down. As the game descended into its' closing stages Ayr showed no sign in letting up. A crafty half-break from Harry Warr once more put Marr on the back foot. Warr was brought down but a offload out the back door fell in the hands of Kyle Rowe who showed no signs of being caught. Jack Rennie converted. The final score of the day came from Jamie Bova. Ayr impressively swung the ball from side-to-side, keeping it alive in the face of what was stiff defence from a Marr side playing for pride. It eventually landed in the hands of Bova who managed to drive through a recovering tackle and into the corner. "A pleasing thing for me was all of our players who came off the bench and our young players who made a real impact. There was a number of guys playing their first game of the season and for the club who played really well. "There is a lot of people putting their hands up for selection". Next week the first XV are back in preseason action when they travel down south to take on Hull Ioanians. As always you can follow the action every step of the way on Twitter @OfficialAyrRFC.